"We're able to probe these particles by making them interfere," said Michael Manfra, the Bill and Dee O'Brian Chair Professor of Physics and Astronomy at Purdue University. "People have been trying to do this for a long time, but there have been major technical challenges." To study particles this small, Manfra's group builds teeny, tiny devices using a crystal growth technique that builds atomic layer by atomic layer, called molecular beam epitaxy. The devices are so small that they confine electrons to two dimensions. Like a marble rolling around on a tabletop, they can't move up or down. If the device, or "tabletop," is clean and smooth enough, what dominates the physics of the experiment is not electrons' individual actions, but how they interact with each other. To minimize the individual energy of particles, Manfra's team cooled them down to extremely low temperatures—around -460 degrees Fahrenheit. Additionally, the electrons were subjected to a large magnetic field. Under these three conditions: extremely cold temperatures, confined to two dimensions, and exposed to a magnetic field, really strange physics starts to happen. Physicists call this the fractional quantum hall regime. "In these exotic conditions, electrons can arrange themselves so that the basic object looks like it carries one-third of an electron charge," said Manfra, who is also a professor of materials engineering, and electrical and computer engineering. "We think of elementary particles as either bosons or fermions, depending on the spin of the particle, but our quasiparticles have a much more complex behavior as they evolve around each other. Determining the charge and statistical properties of these states is a long-standing challenge in quantum physics." To make the particles interfere, Manfra's group built an interferometer: a device that merges two or more sources of quasiparticles to create an interference pattern. If you threw two stones into a pond, and their waves intersected at some point, this is where they would generate interference and the patterns would change. But replicating these effects on a much smaller scale is extremely difficult. In such a cramped space, electrons tend to repel each other, so it costs additional energy to fit another electron into the space. This tends to mess up the interference effects so researchers can't see them clearly. The Purdue interferometer overcomes this challenge by adding metallic plates only 25 nanometers away from the interfering quasiparticles. The metallic plates screen out the repulsive interactions, reducing energy cost and allowing interference to occur. The new device has identical walls on each side and metal gates, somewhat like a pinball machine. But unlike a pinball, which scatters around chaotically, the electrons in this device follow a very strict pattern. "The magic of the quantum hall effect is that all of the current will travel on the edge of the sample, not through the middle," said James Nakamura, Ph.D. candidate at Purdue and lead author of the paper. "When quasiparticles are tunneled across the beam splitter, they're split in half, in a quantum mechanical sense. That happens twice, at two beam splitters, and interference occurs between the two different paths." In such a bizarre realm of physics, it can be difficult for researchers to know if what they think they're seeing is what they're actually seeing. But these results show that, potentially for the first time, researchers have witnessed the quantum mechanical interference of quasiparticles. 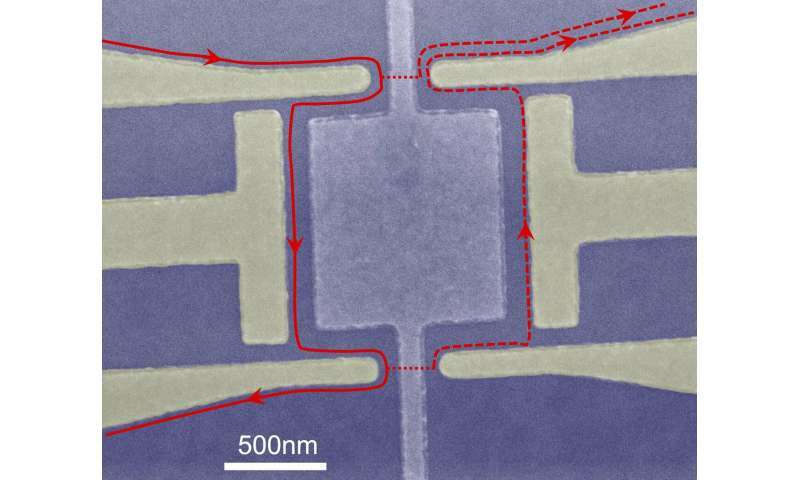 This mechanism could also help in the development of topological qubits down the road. 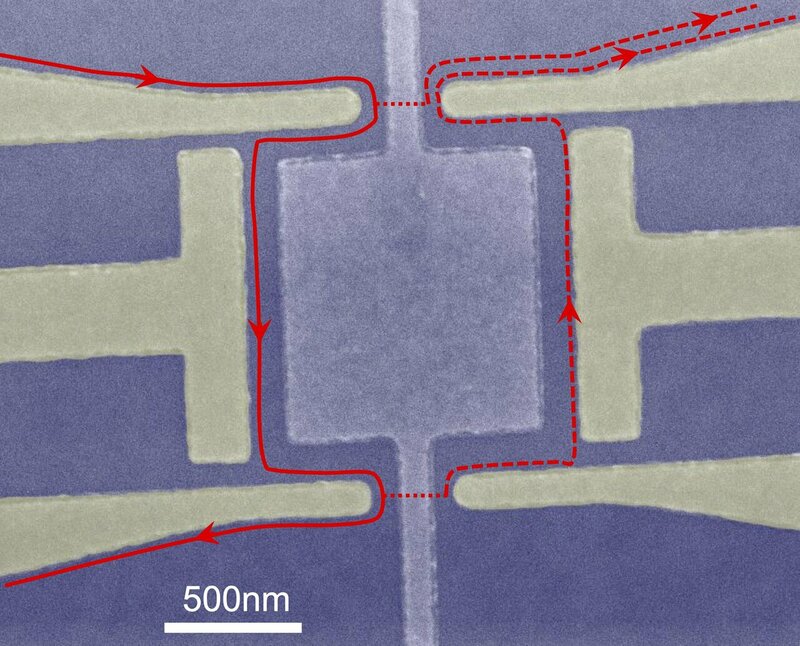 "As far as we know, this is the only viable platform for trying to do more complex experiments that may, in more complicated states, be the basis of a topological qubit," Manfra said. "We've been trying to build these for a while, with the end goal of validating some of these very strange properties. We're not all the way there yet, but we have shown this is the best way forward."